Being vegan is usually something people associate with diet, though I don’t have enough fingers and toes to count the number of times I’ve been accused of being a hypocrite for not having thrown out all my leather shoes when I decided to take the plunge into being vegan. What we put in our bodies matters and so does what we put on them. Things we rub on our skin and even dyes and treatments from our clothing can be absorbed into our bodies, particularly when we sweat. This is why I’m writing about deodorant. We all sweat, even if you’re living in Chicago in the winter. Typical deodorants are mostly vegan in terms of the ingredients so you have to keep an eye out for specific chemicals with indecipherable names like lanolin, hyaluronate and allantoin. There are other chemicals that you might avoid like parabens, pthalates and polyethylene glycol (PEG) that are often vegan but aren’t particularly good for your body. With deodorants I try to avoid variants of alum or aluminum which is a common antiperspirant. Aluminum compounds cause our pores to close and our sweat glands to clog with a plug that prevents perspiration. I don’t want it in my body, especially in light of research that suggests that aluminum can contribute to the development of certain cancers and degenerative brain diseases. It also contributes to the yellow stains on our light colored clothing around the armpit area when the aluminum reacts with laundry detergent… but who cares about that when there’s cancer and dementia? I also check on whether or not the company does animal testing before I buy their cosmetics. Some vegans boycott all products from any company that tests on animals but this can be incredibly inconvenient and prohibitively expensive to track down products that work AND don’t break the bank. I avoid a few major companies that are notorious for animal testing like Procter&Gamble which makes Secret and Old spice brand deodorants and Church&Dwight which manufactures Arm&Hammer products. Otherwise I pick and choose depending on my research. I’ve tried several different brands of vegan deodorants from companies that don’t do animal testing: Tom’s of Maine, LaVanila, Earth Science, Bubble&Bee, and JASON. I’m familiar with crystal deodorants like Thai deodorant stone and Naturally Fresh but they didn’t work for me: I sweat so much that it’s gone within 10-20 minutes. I’m a naturally sweaty girl who has periodically had odor problems on which we’ll not elaborate. I’m also operating in Florida’s 90 degree heat and 80 percent humidity during what we call the “jiu jitsu challenge” which is 2 hours of wrestling with giant sweaty men followed by a trip to the supermarket: perfect opportunity for copious sweat and subsequent formation of stench. LaVanila This one smells fabulous (I tried vanilla coconut), light and neutral enough that it won’t interfere with the fragrances in most other perfumes and lotions (but I’m partial to vanilla and coconut). The texture was lovely (hybrid creamy and gel-like) and it worked. I wasn’t stinky and my level of perspiration is manageable. Some of the ingredients were highly processed even though they were all vegan and relatively inoffensive. It was pricey at $18 and came in several other variants of vanilla: plain vanilla (nothing plain about it, it smells lovely), vanilla grapefruit, vanilla blossom and vanilla lavender. Tom’s of Maine This particular gel deodorant didn’t do quite as well as I’d hoped. I tried the lemongrass which smelled divine (perfect on Brent) but the ingredients included propylene glycol. Propylene glycol isn’t a horrible chemical in or of itself but it is easily absorbed through the skin and can bring nasty contaminants with it, so if you’re like me and come into contact with carcinogens at or on your way to work (like printer toners, industrial cleaning fluids or just environmental pollutants, consider skipping propylene glycol). It also didn’t manage to suppress my personal odor or level of sweating. The worst part is that it dried out the skin in my pits and stung upon application when I used it after waxing; I suspect this is because of the alcohol groups on some of the chemicals. On the up-side, it didn’t leave white marks on my clothes. There were several other scents including apricot, calendula and lavender as well as an unscented variety. It cost $5.50 but wasn’t worth it for me. Earth Science This lavender scented gel product gave me about the same result as Tom’s of Maine. It provided some cover with it’s scent but didn’t retard my natural smell or significantly reduce my level of sweat. It also contained propylene glycol. Scents included lavender, herbal, unscented and rosemary. It cost $6 and didn’t leave marks on my clothes but wasn’t worth the trouble. Jason Tea tree oil is the dominant fragrance in this particular deodorant that doesn’t contain propylene glycol but does contain a number of equally processed and easily adsorbed metals and small molecules like zinc and an isomer of propylene glycol called propanediol. An isomer has the same chemical composition but in a different configuration and in this case, similar chemical properties (not unlike sugar isomers fructose and glucose). It also didn’t do much for my stench except mask it with particularly medicinal smelling tea tree oil. It comes in a few other scents like lavender and apricot but if tea tree isn’t enough, I doubt that the others could meet my needs. This one also cost $6. Bubble and Bee This was a chance encounter. 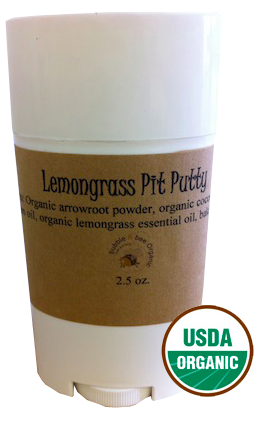 I found this product “Pit Putty” online and was impressed by the list of ingredients: arrowroot starch, coconut oil and essential oils for fragrance with or without baking soda. The texture is pasty and it left white marks on my clothes but it really works. I’d rather have white marks than body odor. After the jiu jitsu challenge, we tested it on a grueling 6 mile hike through the mountains of upstate New York… it kept wetness and odor under control. I still smelled like geranium lime and Brent still smelled like lemongrass despite copious dirt caked into the sweat on our legs, speckled with occasional hemlock leaves and a few bugs. It was $10 for regular and $11 with baking soda (recommended) which seemed reasonable for what it does and how much I like the simple organic ingredients. It also comes in a variety of scents: lemongrass, geranium lime, jasmint, lemon clove and spearmint tea tree. It also didn’t irritate newly waxed pit skin like Tom’s, JASON and Earth Science did. Given how well this product works and how straightforward the packaging and ingredients are, I’m looking forward to trying their other products… and the white marks are nothing a damp wash cloth can’t handle. So to wrap this up, Bubble and Bee and LaVanila were the most effective but Bubble&Bee is the winner overall for those of us who are sweatier and stinkier. If you’ve got a favorite, let me know and I’ll give it a try. If you’re one of those lucky folks who just isn’t sweaty or smelly… I have pit envy. Stinky vegans, BEGONE! Pleasantly scented vegans, go forth and dispel stereotypes!!! Christie! I’ve really struggled with finding a good natural deodorant that was inexpensive as well. Have you tried making your own? I have a recipe in this post that is super similar to your favorite one of the crop above. It’s super cheap to whip up your own and I’ve been using it for a couple of months now and I’m still really happy with it! It is super inexpensive and easy to put together! Thank-you for this: you totally read my mind! Dude, you totally won, and I mean not a “rigged win” I put your name on the list with the others and random.org put you at the VERY TOP. Radical! LOVE this. This is really helpful because I didn’t know sh@! about why my aluminum deodorant is bad. I’m so glad I know now. I’m a very sweaty lady, too, so I really trust this review. Thank you!! Good writing skills take more than just education. It��s passion that sets the good and great writers apart. I see you have passion and skills. I recently launched a vegan deodorant line at http://www.CaitlinSuperNatural.com. Check it out! All of the ingredients that I use are natural and nourishing for the skin…..all of the deodorizing ability comes from plants and probiotics! Lavilin is a great product. Many have told me they had rashes and bumps, but that Lavilin helped to resolve the issue.